Mark Color Sorter has been established in Coimbatore as a color sorter manufacturing company in South India. Our traditional business model is based on the accomplishment of color sorter machine markets in all over India and abroad. Based on the decision of our company to add your product value with our mark color sorter. There is a great need for certification in the future to deal with some color sorter machine transactions. We can assure you that we never compromise on our quality standards and best in the market at present & feature. This product has its own grasp on overseas market also and having a very good reputation. 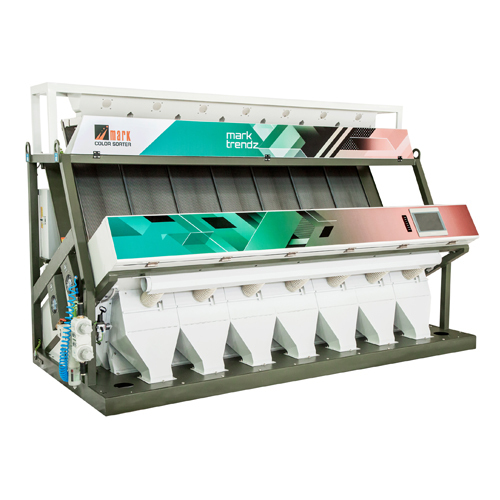 Our Tri-Chromatic Color sorter Machine is available at very competitive prices. Our new product is attracting a great positive feedback from the customers and also we belive it will satisfy all customers. We assure you that you will be satisfied with its result. We are hoping for a better business deal with you for this Tri-Chromatic Color sorter Machine. Fully digital FPGA image processing with micro controller supported ensures high output with low rejection.